Sherlock returns! 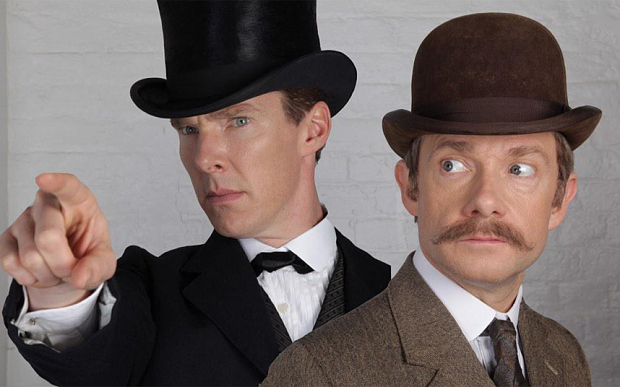 Yes, BBC's Sherlock returns with an upcoming 90 minute special. From the above clip, this special appears to be fun self-aware throwback to the original stories set in Victorian England. Apparently, after the special, the series will return with its usual three episode season. Obviously, I am excited for this new special! I am curious as to whether this is going to be entirely self-aware or only that small part of it, and if it is going to adapt one of the original stories. Either way, this should be a blast to watch! What do you think of this Sherlock special? Please comment below and let me know. Also, sorry everyone if I am late commenting. My computer is dying, so I have to figure out how to fix it.